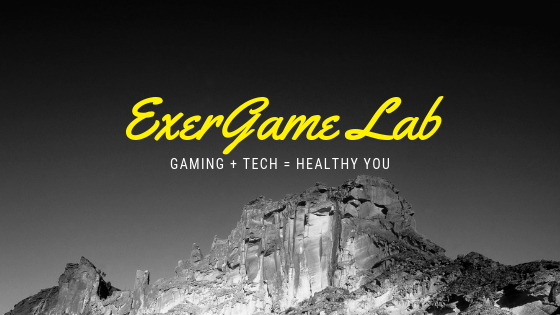 Blue Goji has been one of the original companies to jump into active gaming and it's been great to see their progress into corporate wellness and VR gaming. Using an iPad to play games was quite non-active until Blue Goji introduced the their Bluetooth controllers to interact with the game elements. While jumping, turning and ducking are controlled with some deft button smashing, the iOS app taps into the iPad's accelerometers to detect a player's running or cycling speed and adjusts the avatar appropriately. I must thank Charles Huang for sending me these test units. I have not tried their newer games and VR versions, but I can guess it will definitely be more immersive. I've even used the device with someone running in place (not on a treadmill or cycle) and my students liked it. I was interviewed for a fitness news piece a while back and took a selfie while setting up.